Portuguese Synagogue is also known as the Esnoga, or Snoge and is a magnificent 17th-century Sephardic synagogue in the city of Amsterdam. The destination is famed among tourists for its architecture and is visited by travellers all year round. Visit the destination and witness for yourself the splendor and beauty of the synagogue and take a walk through history. The place was completed in 1675 and has been in the limelight ever since. Take a tram from Amsterdam, Mr. Visserplein. Take a bus from Amsterdam, Waterlooplein. How popular is Portuguese Synagogue? 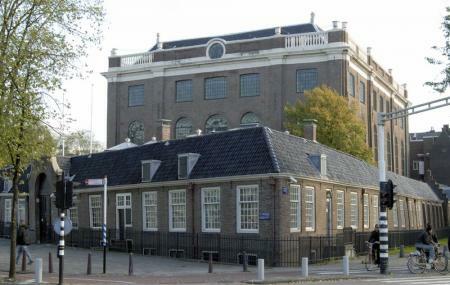 People normally club together Hermitage Amsterdam and Civic Guards Gallery while planning their visit to Portuguese Synagogue. People also prefer to start their day with Portuguese Synagogue. This is a great building to have a look around. Very interesting museum inside and somewhere that I had been a couple of times before. The interactive displays are both informative and entertaining. The photography exhibition in the basement area is also very interesting. Interesting museum, worth a stop. The Synagogue is packed full of history. Comes with an audio guide. You can combine it with 3 other museums in one ticket. All worth seeing. 17 euros and they don't even supply a locker to keep things and expect you to walk for half an hour to a locker shop. Ridiculous! It could be a bit cheaper but it gives access to other museus if you are interested in WWII and the jewish community before, during and after the war. The synagogue was amazing and well described during the visit with audio guides. People there very friendly to help if you have any question about anything. One ticket will gain you access to the Portuguese Synagogue, the Jewish Historical center and both Holocaust Memorials. This beautiful temple is worth the effort. An audio guide is included and gives you the history of this late 17th century building. There is no electricity in the synagogue, so the building is not heated and it's lit only by the candles in the chandeliers. Near the entry point, there's a treasures building with a video presentation and audio guide points showing artifacts used in the synagogue.